his antique manor was saved by Mr Joseph and Christopher Rylski - the Ostoya crest. he Ostoya Manor, called The Jasionowski Manor too, was built at three stages. t originated at suggestion of Mrs Zofia Czosnkowska - Oborska, who received a secluded nook from Mr Ignacy Morski. 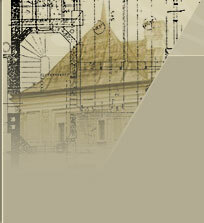 An architect of the manor was probably Fryderyk Barman, who used one of Christian Piotr Aigner's project. s mentioned above, the story of manor can be divided into three stages. he first one was represented by classicistic architectural form. In the second one considering the practice obliged the owners of manor to enlarge its living space and separate the servants' part, which now adjoins the tower. It was probably dated on the third part of XIX century. At the time Mr Henryk Jędrzejewski bought the manor from the Korzeniowski family. rom 1887 Mr Stanisław Maria Jędrzejowicz - an architect - began to cooperate with Mr Tadeusz Stryjeński to enlarge and develop the south - west part of the manor. Then the romantic pinnacle at staircase was liquidated likening the manor to the palace model. fter the Second World War the manor has had its days. There were offices and warehouses bringing about the ruin of the manor.